Verizon Wireless is known for trying new, innovative things to expand its business and reach new customers. In the competitive mobile space, it takes a concerted effort to build the customer experience. 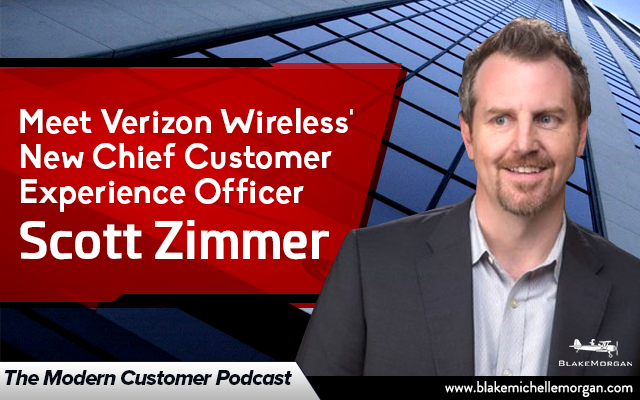 Verizon Wireless recently took it a step further when it brought in Scott Zimmer to serve in a new position as its Chief Customer Experience Officer. According to Scott, customer experience definitely creates a competitive advantage over other companies. Verizon’s goal is to go above and beyond to build brand loyalty and brand love so that customers prefer the company for reasons beyond it just having the best price. Its perspective and practices can help companies in all industries. Verizon views the customer experience as a complete journey, from a prospective customer looking into the company to actually making a purchase to then using the service and having a continued great experience. With interactions happening online, in person, in the app, and on the phone, the company aims to make every interaction consistent with the Verizon brand. One new way it is doing that is through its new concept store in San Francisco. The next-gen retail store concept adds emotion and humanity to a technology service and is another opportunity for Verizon to build relationships with customers. Scott says that the retail store experience can be used by other companies and industries that can apply their products and services in a tangible space. For Verizon, that means creating a coffee shop-esque space that shows off its products, including virtual reality headsets that customers can test. Scott brings together experience in the business and customer spaces and states that every company should be thinking of business and customer strategies in tandem. If a company only focuses on business, it won’t have customers, but if it only focuses on customers, it won’t have business. To truly create a unique customer experience, brands need to build emotional connections while still showcasing their products and driving sales. The keys to a great customer experience include having a corporate culture that reflects customer values and leaders who set the tone for a customer focus. In order to provide a consistent experience that meets the customer where they, Scott and his team involve every employee to connect the dots of the entire customer journey. Every detail impacts customer service, and making it a priority in everything the company does can lead to great success, especially in an industry as competitive as wireless. Verizon is an example of the benefits that come from prioritizing customer experience and investing the resources to put customers first.